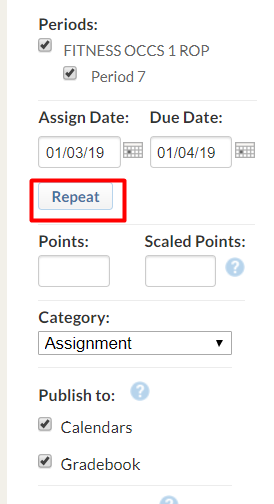 For each assignment in Assign Work (Plus), you must assign the work to a single course by period, set the assign and due dates, and give it a title. There are several optional settings such as adding and previewing files or links (these will be available for both parents and students to download), choosing a category (essential if you use weighting), and setting the point value (for assignments that will appear in the Gradebook). This is a guide on how to add/change assigned dates and due dates. The Assigned Date and Due Date will default to today and the next weekday, respectively. To change this setting, click the calendar icon next to the date field and select the desired date from the pop-up calendar. 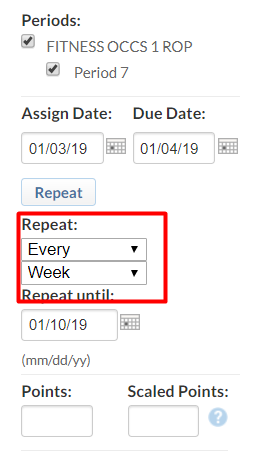 The Repeat option allows you to create a recurring assignment (e.g., a weekly quiz). Check the Repeat option just below the assign date to reveal the options. 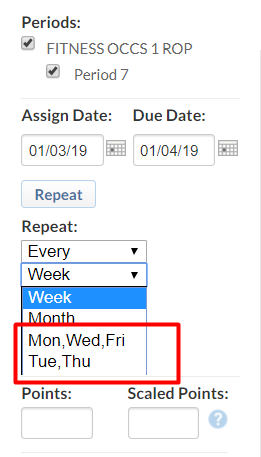 If you wish to have a recurring assignment on school days (Mon-Fri), then consider making two recurring assignments: one using the MWF (Monday, Wednesday, and Friday) option, and one using the T/Th (Tuesday and Thursday)option.